This research guide provides basic information on how to conduct research in foreign and international law. Black's Law Dictionary (10th ed. 2014) defines foreign law as "generally, the law of another country". Foreign law covers the national and sub-national (e.g. provincial) laws of other jurisdictions. Not to be confused with comparative law, which is the study of domestic law between or among individual countries. Treaties and other international agreements fall under international law. Understand the structure of the foreign legal system. ​​​​Is it a civil law system based on codes, a common law system (such as England) or another? For a quick look at the legal system of particular country, consult JuriGlobe. Do you have a citation to the law, article, etc.? Do you need the complete text of the law, a summary, an English translation, or a detailed explanation or commentary? If the material you need is not owned or available at Cornell, you can request it through either InterLibrary Loan or Borrow Direct. ​​Secondary sources are extremely helpful tools to begin your research since these sources describe the law or legal issue, provide commentary, and put the issue into context. This book emphasizes legal research strategies applicable across the landscape of research sources. Topics covered in the book range from a general chapter on basic concepts to five chapters on particular subjects of international law. Each major aspect of research, such as using periodical indexes, is treated once in depth. This Nutshell provides a basic introduction to international and foreign legal research for the non-specialist. It offers guidance through the unfamiliar pathways of research using international and non-US legal legal materials and demystifies the world of treaties and international case law. Password Protected - access restricted to Law School students and faculty. Members of the Cornell Law School community can access the password list for password-protected databases by clicking HERE. Personal Account - law students and faculty access using personal accounts. Contact the Law Library Reference Desk for more information. There is some academic dispute over how to classify or group national legal systems. Most scholars seem to agree that there are five types of legal systems: civil law, common law, customary law, religious law, and mixed legal systems. Many systems are mixed because two or more legal systems operate within the same jurisdiction. The following paragraphs provide only a very general overview of legal systems. The United States, like most former British colonies, has a common law legal system. While the original common law system consisted of judicial precedents and few statutes, modern common law systems usually express much of their law in statutes. Even in these modern common law systems, however, judicial interpretations of the law (i.e. court decisions) are an important source of law. Statues in common law systems do not usually prescribe comprehensive rules for an entire area of activity (e.g. commerce). Most civil law systems are based on comprehensive written codes, designed to address an entire area of activity (e.g. criminal law , commerce, civil procedure). Most countries have civil law systems. In these systems, courts ordinarily decide cases only for the parties before them; court decisions do not officially carry any precedential value. Civil law systems originated in Roman law but have evolved in different directions. 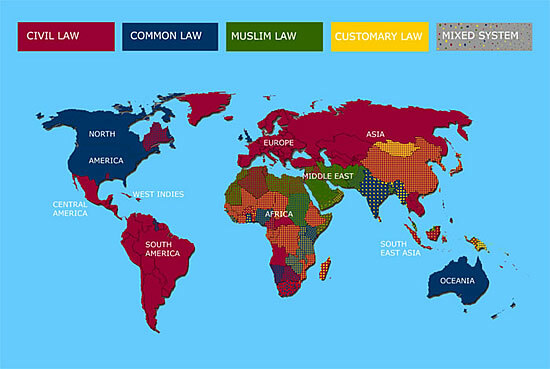 Customary law plays a role in some legal systems, though no country operates solely under a customary law system. Customary law tends to govern areas of personal conduct, inheritance, and marriage. Most often, customary law is unwritten and is dispensed by persons with elected or hereditary roles within a small community. Most religious legal systems based on Islam, although some communities, and one country (Israel), operate in part based on Judaic law. Generally, religious legal systems operate within countries that also have a civil or common law system. Religious law usually applies to issues of personal status (e.g. marriage) and may apply only to some residents of a country. Mixed legal systems are not a separate type of legal system. Instead, they are a useful way to characterize countries that include elements of more than one legal system. Because Quebec and Louisiana operate under some elements of civil law systems, for example, you could say that Canada and and the United States are mixed legal systems. From Marci Hoffman & Mary Rumsey, International and Foreign Legal Research: A Coursebook 4 (2d ed., Martinus Nijhoff 2012). Formed by professors from the Faculty of Law of the University of Ottawa, JuriGlobe contains general information about the legal systems and official languages of countries around the world. The site has maps and graphics that allow an easy comparison between countries. The Bluebook devotes Rule 20 and much of Table T2 to foreign sources of law. Created by the Journal of International Law and Politics at New York University, the Guide to Foreign and International Legal Citations is the most comprehensive source for international citations rules, including 45 country citation systems, as well as citation rules for international organizations, tribunals, and treaties. The Cardiff Index to Legal Abbreviations​ is a web-based service that allows the user to search for the meaning of abbreviations for English language legal publications, from the British Isles, the Commonwealth and the United States, including those covering international and comparative law. A wide selection of major foreign language law publications is also included. Publications from over 295 jurisdictions are featured in the Index. The database mainly covers law reports and law periodicals, but some legislative publications and major textbooks are also included. To learn more about other available study aids, including Lexis and Westlaw, press here. This HeinOnline database includes international yearbooks and periodicals, law digests, international tribunals and judicial decisions (primarily from the Hague Permanent Court of International Justice), as well as other significant works related to foreign and international law. Historical materials currently emphasized. Cornell community only. The Reynolds and Flores Foreign Law Guide is perhaps the most well-known and respected research aid for foreign law. For every country in the world, it provides a brief political history, a description of the legislative and judicial system, identifies all primary and some secondary sources of law by title, and provides subject access into each country's statutory code. Links to official websites are given where available. Keyword searching is available. Funding for this resource is generously provided through the International and Comparative Law Collections Fund established by Jack G. Clarke, Esq., LLB '52. Published by the Hauser Global Law School Program at NYU School of Law, GlobalLex is an electronic legal publication dedicated to international and foreign law research. The Guide to Law Online, prepared by the Law Library of Congress Public Services Division, is an annotated guide to sources of information on government and law available online. (1985 – Present) Database contains citations to articles in over 450 legal journals, as well as essay collections, festschriften, and US Congressional reports. Coverage includes comparative, municipal, and public and private international law of countries other than the US, the UK and the British Commonwealth. LLMC provides access to digital images from over 7,500 titles of historic legal literature and government documents. Keyword searchable. Brings together foreign, comparative, and international titles from 1600 to 1926 in a single resource. The Foreign Law component features foreign legal treatises of a variety of countries. Because the term "treatise" is more of a common-law category, the equivalent works in civil-law systems may have other names such as commentaries, encyclopedias, textbooks, monographs, or festschriften. Also searchable through Artemis Primary Sources. Includes historical legal codes, statutes, regulations, and commentaries on codes from the United Kingdom, France, Germany, and other countries in northern Europe. Also searchable through Artemis Primary Sources. Collection of full-text searchable images of notable foreign and comparative law titles. Includes Szladits' Bibliography on Foreign and Comparative Law: Books and Articles in English. Includes cases, statutes, and regulations of India, and cases from Bangladesh, Canada, Pakistan, Sri Lanka, Thailand, Tanzania, Nigeria, Uganda, Zimbabwe, Botswana, Lesotho, Namibia, Mauritius, Seychelles, Swaziland, Zambia, and Kenya. First-time users should enter a Cornell email address to register. World Constitutions Illustrated from HeinOnline contains every country's constitution in its original language (many English translations are also available), books about the development of constitutional law, and links to scholarly articles and Internet resources on foreign constitutional law. For country-specific databases as well as others, press here.